From Butler, at the intersection of U.S. Highway 71 and Missouri Highway 52 west, go west 10 miles to the intersection with County Highway J, turn right (north) and go 1 miles, turn left (west) onto gravel road (county road # 4002), go 1 mile west to intersection with county road #11001, turn right (north) and go ½ mile to county road # 4502, turn left (west) and go1/2 mile. The cemetery is on the north side of the road. Murdered for his cattle Aug. 27, 1878 - by Richard Isaacs, who was captured Sept. 5, tried and sentenced to death on Sept. 25, and was executed Oct. 25, 1878.
wife of Alexander Morwood Sr.
child of John T. & Mary M.
The Mulberry Cemetery was organized March 21, 1874. 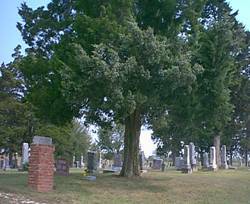 The oldest side of the cemetery is on the east. This photograph was taken between 1910 and 1915 and shows the Mulberry Hayseeds Band in full uniform.